The Elie tornado was filmed from several angles as it caused F5 damage to a row of homes on Elie Street. One videographer captured an entire house being lifted into the air moments before it disintegrated. □ The Elie tornado of June 22, 2007, was a severe weather fanatic’s treat. Unlike most violent tornadoes, the Elie storm was slow-moving, clearly visible and exceptionally small, which provided photographers ample opportunity to document the rope-like funnel from close proximity. The event remains the most recent F5 tornado on the now semi-outdated Fujita scale. 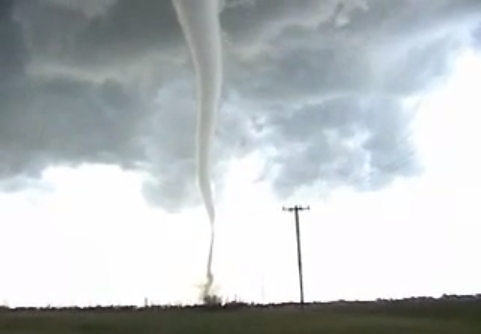 Several months passed before authorities at Environment Canada upgraded the tornado from an F4 to an F5. Many suspected the upgrade was motivated more by a sense of novelty than objectivity. Footage of the tornado and a close review of the damage survey, however, indicate that the F5 rating was appropriate. The Elie tornado developed under unusual circumstances. It was spawned from a low precipitation supercell that had very little falling rain or hail. Unlike most violent tornadoes, the storm travelled generally to the southeast and executed several counterclockwise loops as it tore through fields south of the Trans-Canada Highway (McCarthy et al., 2007). From beginning to end, the tornado travelled only four miles. When the tornado’s meandering motion is taken into account, the total path length was closer to eight miles. The storm expanded to approximately 150 yards in width during its mature stage, but failed to strike any buildings while at maximum size. After roping out, the tornado passed directly over four homes on Elie Street after narrowing to around 35 yards in width. Surveyors initially believed that the tornado moved over the row of houses from the northwest, but it was later shown that the storm struck the area while completing a counterclockwise loop after stalling in a field to the south (McCarthy et al., 2007). a) Ripped an entire frame home from its anchorage and hurled it through the air. b) Lifted a 3/4 ton GM van high into the air and centrifuged it out of the funnel at a high rate of speed. The van was thrown 150 yards in one toss before bouncing an additional 15 yards, finally coming to rest in a mangled state in a field to the south (commences at :11 in the clip below). c) Rotated in a manner consistent with winds well over 200mph. 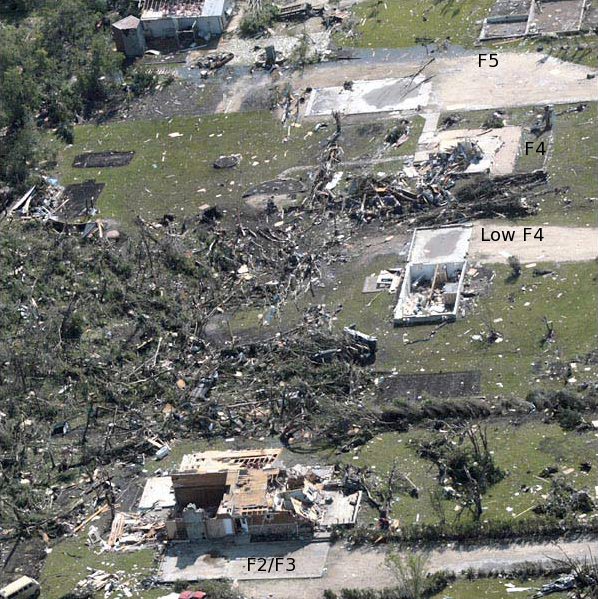 The damage caused by the Elie tornado with determined F-scale values next to each property is shown above. The home swept clean from its foundation in the upper right corner was the basis of the F5 rating. The home was found to have been well-constructed and bolted to its foundation. The house beneath it was completely destroyed except for a section around the fireplace. The empty basement at center is the remains of the home that was filmed being lofted into the air. The house was of decent but questionable construction, so the damage was deemed to be of low-end F4 intensity. At bottom is a very well-constructed home that received damage categorized as upper F2 or lower F3 intensity. The extremely narrow tornado swept part of the house away, exposing the foundation underneath. A map of the tornado’s path. Officials at Environment Canada initially believed that the tornado entered the destroyed area from the northwest but later analysis indicated the storm travelled east along Elie Street before looping northward and then to the southwest. An interesting feature of the Elie tornado was its appearance while at F5 intensity. 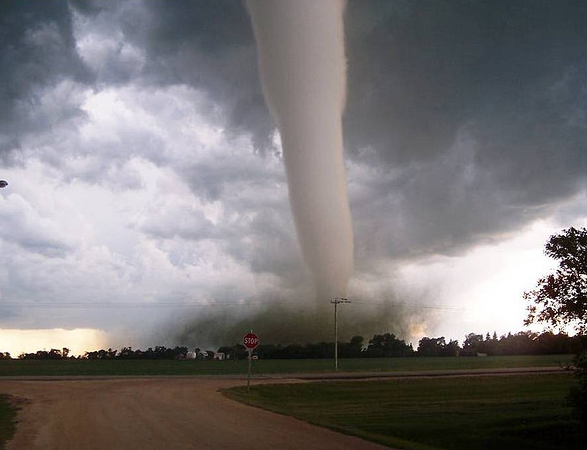 The tornado was near the end of its life and appeared to be in its decaying stage when the extreme damage occurred. The funnel had lost consistent contact with the ground and was spinning and reforming above a narrow core of extreme winds. The shrinking of the tornado’s wind field may have caused the rotation to rapidly accelerate for a brief period of time. Crude photogrammetry of the debris motion (assuming the funnel is 35 yards in diameter and using a 0.5 second time interval) indicates visible winds over 250mph. The well-known Pampa, Texas, tornado of 1995 was similar in many ways to the Elie event. The Pampa tornado was a bit wider than its Canadian sister, but both tornadoes moved very slowly, both had drill-shaped bases and wide debris fields and both were extremely violent. Tom Grazulis’ photogrammetry of the Pampa event indicated ground level winds were around 300 mph (Grazulis, 2001). This video still was taken within seconds of the image above. 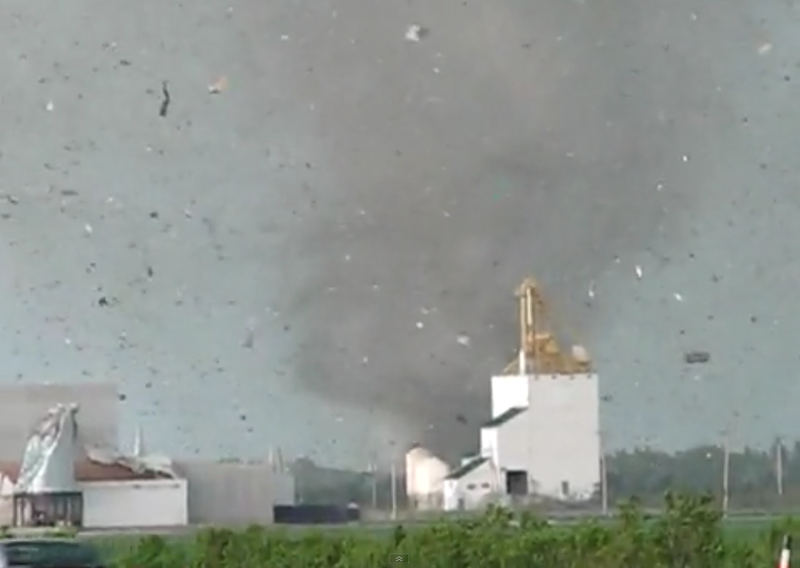 The intensity of the tornado and the size of the airborne debris is far more apparent. A van weighed down with drywall can be seen midair to the right of the funnel. The van was thrown upwards and out of the funnel like a baseball before landing in a field several hundred yards from where it originated (EC, 2007). The Elie event proves that the size and shape of tornadoes is often unrelated to overall intensity. Additionally, the unremarkable appearance of the storm suggests that potentially dozens of tornadoes capable of causing EF5 damage occur each year with little notice. Fast forward to four minutes in. The impressive feat comes about ten seconds later or so.. The dashcam vid from the sheriff, when it zooms in on the cars flying through the air is so amazing to me, not just for that, but how, if you look to the right edge of the camera and you see the motion of the funnel. It looks like it’s having a seizure, it’s spinning so fast. Incredibly old, but I thought to make a reply anyhow. The tornado at 4:00 was approaching a residential district and was weakening; Chuck Doswell actually notes this in one of his chase accounts. The Pampa Tornado reached maximum intensity sometime in the industrial park. The damage after it narrowed down was not particularly severe-no more than F2, I think. What you see at 4:13 is simply a few seconds before 3:52 from a different viewpoint. I did some crude back of the envelope calculations with one guy in the comments section of the YouTube video and got estimates in the range of 270-300 mph. I may import the video into some editing software for a closer look some time. Was that person stormchasermax? If so, that was me. I calculated a value back in the day and got that same basic figures depending on the width of the funnel (I think I settled on the funnel being about 40 yards wide). It’s a very rough estimate, but I would almost bet my entire back account that some of the visible debris particles are moving in excess of 250mph. Yes, I believe it was. 40 yards sounds good. Did you use any video/photo software in this analysis? Nothing fancy, just Final Cut Pro to ascertain the time measurements down to the nearest 100th of a second. I freeze framed about 50 different images during the time I felt the fastest rotation occurred and tracked a few pieces of debris. 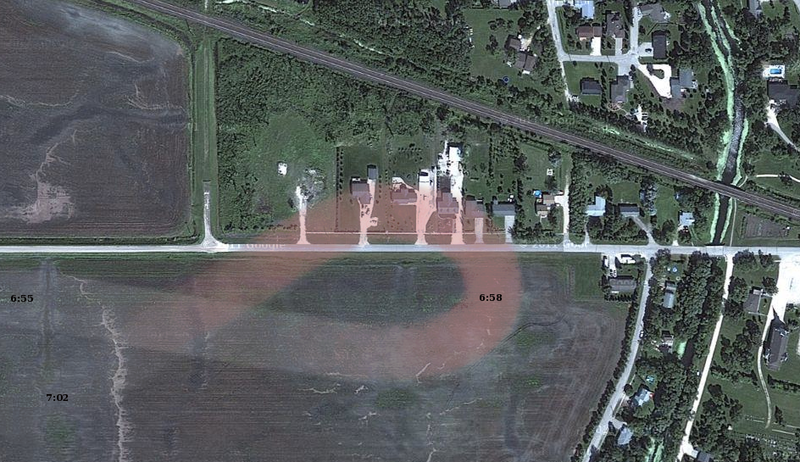 The funnel diameter is likely somewhere between 30 and 50 yards in width near the base. Taking into account the fact that the funnel is circular, that would mean a piece of debris moving from one edge to the other would be traveling approximately 46 to 75 yards (or some fraction thereof). If someone could definitively show that a piece of debris travelled 40 yards in 0.32 seconds, that would indicate 250mph movement. If it travels 40 yards in 0.27 seconds, that’s 300mph. The video was still 30 fps though, right? I’m not sure, but I believe all videos on youtube pre the HD option are 30fps. This tornado occurred about a month and a half after the Greensburg tornado. The Greensburg tornado of course was rated an EF5 on the EF-scale and this tornado was rated an F5 on the F-scale. Although the Greensburg tornado was much more wider and much more catastrophic than this tornado, is it possible this tornado was just as violent if not more violent than the Greensburg tornado. The Greensburg tornado may also have been over a certain area for at least a few minutes before moving on. I have had some doubts if the Greensburg tornado was really an EF5. I was always thinking more like mid to high-end EF4 or thereabouts. I would think the Greensburg tornado if it really was an EF5 I would think the damage would look nearly similar to the Jarrell tornado as long as it stayed over a certain area. I’d say that the main reason this tornado did not result in a significant death toll was that it did not hit Elie head-on and only stuck the edge of town. I think it could be compared to the Sherman. Texas tornado of 1896. In terms of the duration of exposure from the Greensburg tornado, it was multivortex, which complicates the issue. Here is tornado that was pretty narrow when it did F5 damage. It does not seem to be remembered as well as most F5/EF5 tornadoes. http://www.crh.noaa.gov/mkx/document/tor/oakstormdata.php. The Oakfield, Wisconsin tornado on July 18, 1996. This tornado ripped at least 4 well-constructed homes off their foundations, mangled several cars beyond recognition, bent or snapped rebar, completely debarked trees, and scoured corn fields to about 1 inch stubble. It was at times only about 100 yds wide when it did F5 damage. In the NWS statement that remains were unrecognizable. Here is some more information. http://www.aos.wisc.edu/uwaosjournal/Volume1/AOS453/FCS_Berenz.pdf. Here is some damage photos. http://www.tornadoproject.com/past/oakdam8.htm. Most of the violent tornadoes in northern Minnesota, Wisconsin and Central Canada in the late summer are slow moving and very narrow. 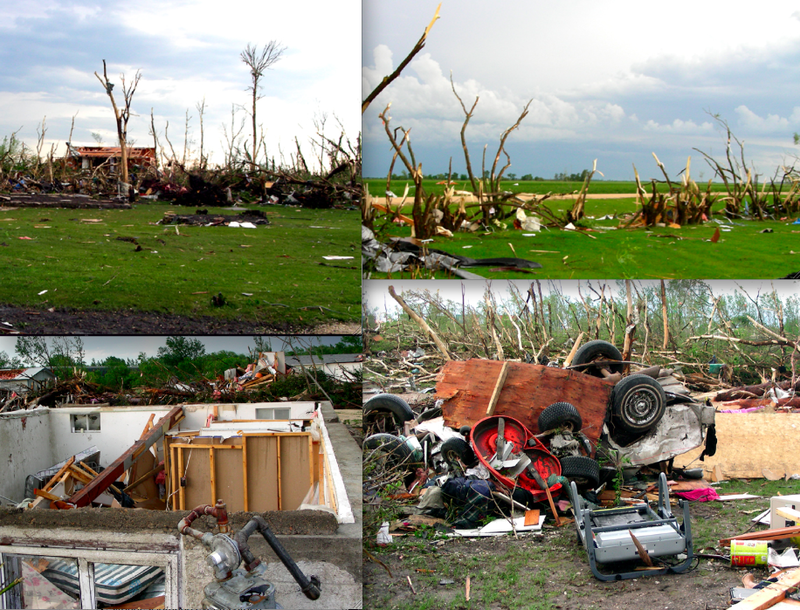 The Wilkins county tornado in August 2010 was only 30 yards wide yet was probably capable of causing EF5 damage. I tend to wonder why most of the narrower F5/EF5 tornadoes tend to be more north. What causes most F5/EF5 tornadoes to be wedges but some F5/EF5 tornadoes to be extremely narrow. I’m not totally sure, but tornadoes in the south often form in conditions with more ambient moisture and lower cloud bases, hence they are more wedge shaped and ragged. Farther north the tornadoes form in dryer conditions with higher cloud bases. Also, the jet stream weakens in the summer so tornadoes farther north tend to move more slowly . I know of one tornado that was very similar in some ways but not quite as narrow as the Elie tornado. It was a pretty stationary tornado and some people wonder if the extreme damage may have occurred because it stayed over the same area for several minutes. The Harper, Kansas tornado on May 12, 2004. It was conservatively given a high-end F4 rating but believe it could easily have been rated F5. The guy who surveyed the damage was being conservative and gave it a high-end F4 rating but wishes at time he would have given it an F5 rating. In addition to the home damage, it produced some of he most amazing ground scouring and tree debarking I have ever seen. It also destroyed an extended cab pick up truck that looked like it had been mangled way beyond recognition. It reminds me of the Jarrell tornado damage but over a much smaller area. It is amazing that nobody was killed in this tornado, even underground, because the damage was so extreme. Greensburg was without a doubt an EF5 (though a marginal one), the only reason people question the rating is because there are little to no pictures of the homes that sustained EF5 damage. There were a total of seven well-anchored homes swept away, two across from the school building, and five on the southern fringes of the city. Trees sustained near-total debarking (links 2 and 3), and context supported a violent tornado, so it was an EF5 any way you slice it. Plus, the rating was backed by Marshall, so I’d say it’s accurate. The Harper tornado caused some of the most intense tornado damage I have ever seen. Very Jarrell-esque. The Harper and 1995 Kellerville tornado would be near the top of my list if I included tornadoes that did not cause fatalities. Do you believe the Elie tornado was more intense than the Greensburg tornado? They both happened in 2007 within a month and a half of each other. It’s hard to say, like I mentioned somewhere else. The tornadoes were total opposites except for their slow motion – one was a narrow, single vortex funnel with a violent updraft and the other was a huge tornado likely with imbedded vortices. The Elie tornado impressed me more but I imagine the Greensburg tornado may have reached greater intensity (within small suction spots) somewhere outside town. You mention seven factors that probably determine if a tornado is E/F5 intensity. How many did the Elie tornado meet? The only ones I can see are well-constructed home swept away, a van loaded with drywall hurled hundreds of yards, and complete tree debarking. Was there any wind rowing in this tornado? Another tornado I also mentioned to you was the Oakfield, Wisconsin tornado on July 18, 1996. It seemed to have done at least several of the factors for E/F5 except it did not kill nor do I see any significant tree debarking. Here are some of the photos I finally found of the damage it produced. OMG just look at that vehicle. http://www.crh.noaa.gov/mkx/document/tor/oakfield_7-18-96.php. 4. The car being mangled severely after being thrown 200/300 yards in one toss. There was no ground scouring to speak of, which only reinforces my belief that EF5 tornadoes that strip the ground are noticeably more intense. Particularly considering the storm’s slow movement, whereas storms with similar sized cores like Smithville clipped along at 70mph and caused even more intense damage. I was wanting to ask you about the house that received an F5 rating. I am not sure but wasn’t even the floor joists, floor pads, and some of the anchor bolts snapped off from the house that received an F5 rating. I believe I read in a subsequent survey that at least several anchor bolts were torn off and some of the sill plates (I think that’s what they were called) shattered. I have always been impressed by that footage as the path of deep scouring looks to be only a few INCHES wide! Reminds me of the footage from Swedan where a tiny vortex less than 18 inches across drills past a car and rips the bark and branches from a tiny tree. What conditions do you think would have lead to the ground scouring in the Kelwood tornado? Could there really have been an extremely small, brief burst of F5 winds? I’m not sure, but in the Kelwood case it was probably an extremely tiny vortex like the one depicted in the Swedish video imbedded within the already narrow tornado. That Swedish video is too freaking cool. 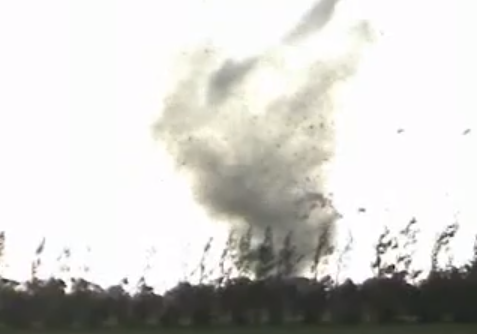 What would you figure was the intensity of the tornado in Sweden, at least in the video? That it carried that tree some distance I had guessed perhaps EF2? Its hard to know since the vortex literally was too small to cause EF2 damage, but the overall tornado was probably an F0/F1 (at the time of the filming) and the tiny subvortex was probably a transient wind feature with winds no more than 100mph – but its tiny size caused extreme opposing forces on the tree. If I remember right, Warner-Robins was another example of a funnel growing stronger at the end of its life cycle. It looks like the as it was hitting the flour mill it might have been more intense, the debris cloud looks very violent and it looks like it is rotating at at least 210mph. sorry if i already commented this link, doesnt seem to be working.